WASHINGTON (AP) — Madeline Peltz works the night shift at the liberal media watchdog group Media Matters for America. Given the timing of that particular shift, one of her main responsibilities is watching Tucker Carlson’s 8 p.m. show on Fox News. MANASSAS, Va. (AP) — The Virginia Republican who embraced Confederate monuments and associated with white supremacists during failed statewide office bids will head a conservative super PAC. Stewart briefly chaired Trump’s 2016 campaign in Virginia before being fired. Before losing to Sen. Tim Kaine last November, Stewart ran unsuccessfully for Republican nominations for governor and lieutenant governor. He’s spent 15 years on the Prince William Board of County Supervisors, but said in January he’d leave politics “until and unless the Commonwealth is ready” for his views. COVINGTON, Ky. (AP) — The Kentucky teen at the heart of a January encounter with a Native American activist at the Lincoln Memorial in Washington has sued CNN for $275 million, alleging the Cable News Network falsely labeled him a racist who instigated a threatening confrontation. “Contrary to its ‘Facts First’ public relations ploy, CNN ignored the facts and put its anti-Trump agenda first in waging a 7-day media campaign for false, vicious attacks against Nicholas,” the lawsuit states. Sandmann’s attorneys also are threatening legal action against The Associated Press and other news organizations. In a letter to the AP, dated Feb. 15, Atlanta-based attorney L. Lin Wood called on the news cooperative to “retract and correct” what his letter asserts are “defamatory statements.” Sandmann also provided his version of the events. The actions of Sandmann and his Covington Catholic High School classmates have been intensely debated since video and photographs emerged of them wearing “Make America Great Again” hats and facing off with Omaha Nation elder Nathan Phillips. Both Sandmann and Nathan Phillips say they were trying to defuse tensions that were rising among three groups on a day Washington hosted both the anti-abortion March for Life, attended by the Covington students, and the Indigenous Peoples March. But video of Sandmann and Phillips standing very close to each other, with Sandmann staring and at times smiling at Phillips as he sang and played a drum, gave some who watched it a different impression. https://www.sunburynews.com/wp-content/uploads/sites/48/2019/03/web1_122520461-72d0899912bf4fd5baaf0f46c67053bb.jpgFILE – This May 7, 2018 file photo shows Donna Brazile speaking at the inauguration of New Orleans Mayor Latoya Cantrell in New Orleans. 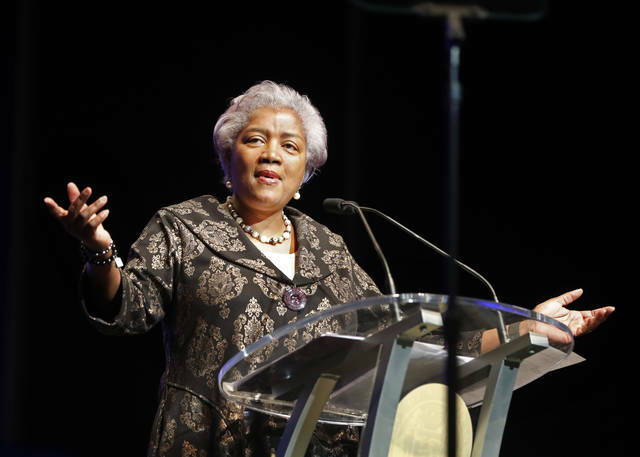 Fox News says it has hired former Democratic National Committee chief Brazile as a political commentator.